The United Nations Department of Global Communications (DGC) in partnership with the United Nations Educational Scientific and Cultural Organization (UNESCO) invite you to an event in celebration of World Press Freedom Day 2019. NEW DATE: 5 March - Civil Society Tuesday Chat Series "New Year, New Name: Who we are, What we do"
Civil Society Briefing "A Matter of Humanity: The Rescue of Jews in Albania during the Holocaust"
Time: 11 a.m. - 12:30 a.m.
Join us for the first Civil Society Briefing in 2019 "Giving Back to Create Inclusive and Sustainable Communities"
First Chat Series in Fall 2018 is youth-led session "Youth 2030: making the UN Youth Stratefy a reality!" Join us for the first Briefing of the Fall 2018 Season! Join us for a Townhall to discuss the planning of the upcomig 68th UN DPI/NGO Confenrence in Salt Lake City, Utah. On the occasion of the 67th UN DPI/NGO Conference, the #UNBookshop is hosting a book signing with Hunter Lovins, author of "A Finer Future: Creating an Economy in Service to Life." Come meet the sustainable development advocate and pick up a FREE copy of the book! The UN Library is organizing special training sessions for participants of the 67th UN DPI/NGO Conference. The Department of Public Information (DPI) welcomed Ms. Winnie Byanyima and members of Oxfam International to discuss her role as Chair of the 67th UN DPI/NGO Conference. Ms. Byanyima expressed her excitement about the upcoming conference and her involvement in the planning process. The 67th UN DPI/NGO Conference will take place 22 - 23 August 2018 at the United Nations Headquarters in New York. It will focus on the value of multilateralism to identify and implement global solutions for global problems, to discuss concrete ways for the UN, in partnership with NGOs and civil society at large, to take the fundamental vision of these people-centered mandate forward, and to examine the repositioned UN Development Systems as a platform to work and advocate in closer partnership. The United Nations Department of Public Information (DPI), the United Nations Educational Scientific and Cultural Organization (UNESCO), and the Group of Friends for the Protection of Journalists* in New York invite you to an event in commemoration of 2018 World Press Freedom Day "Keeping Power in Check: Media, Justice and The Rule of Law"
High-Level Opening Session: 10 - 11 a.m.
Panel Discussion: 11 a.m. - 1 p.m.
Save the Date!The 67th UN DPI/NGO ConferenceDates: 22 - 23 August 2018 Location: United Nations Headquarters, New York. Pre-registration is now open! Briefing Session: 11:30 a.m. - 12:45 p.m.
Networking Session: 1 - 2:30 p.m. The annual Youth Forum of the Economic and Social Council (ECOSOC), is a platform where young people can contribute to policy discussions at the United Nations through their collective ideas, solutions and innovations. The Forum allows representatives of youth-led and youth-focused organizations and networks, youth advocates and others to dialogue with Member States, and to explore ways and means of promoting youth development and engagement. Organized in observance of the International Day of Commemoration in memory of the victims of the Holocaust#HolocaustremembranceDate: Thursday, 25 January 2018Time: 11 a.m. Considering the scaling incidences of violent extremism, incessant and growing poverty, and unprecedented challenges posed by natural disasters, it is abundantly clear that there is a dire need for engagement and participation from the youth. Join us for a dialogue with Assistant Secretary-General Jane Connors on her role as the first UN Victims’ Rights Advocate on sexual exploitation and abuse. Morning Discussion: 10 a.m. - 1 p.m. Afternoon Workshop: 3 - 5 p.m.
7 December 2017 - Thursday Briefing "Stand Up for Human Rights"
16 November 2017 - Thursday Briefing "Fashion and Sustainability: Look Good, Feel Good, Do Good"
Time: 11 a.m. - 1:15 p.m. The NGO Relations Unit in DPI will host its 2017 Fall Orientation Programme on Thursday, 9 November. This Orientation Programme serves as an introduction to newly DPI-associated NGOs, as well as newly appointed NGO representatives to the United Nations through DPI, to the work, structure and operational mechanisms of the United Nations. Time: 9 a.m. - 5:45 p.m.
2 November 2017 Youth-Led Briefing "YOUnited: An In-Depth Look at How Youth Can Affect Change Through Policy and Action"
Join us for a dialogue with H.E. Mr. Miroslav Lajčák on his agenda for the seventy-second session of the UN General Assembly and civil society engagement. 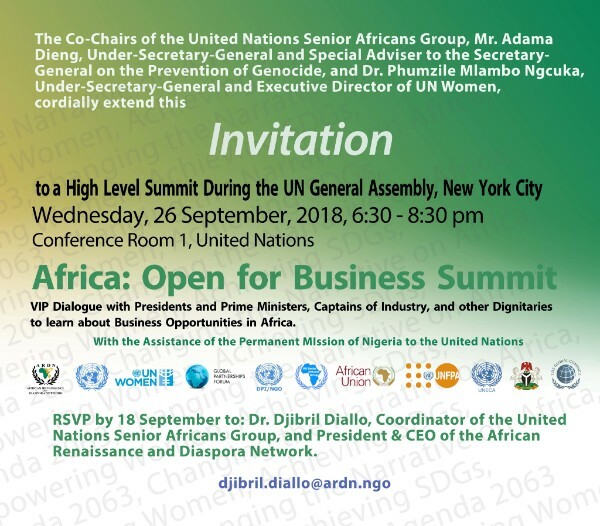 Join us as we present the highlights of the past season of DPI/NGO events, the annual review stats and the upcoming Intergenerational Dialogues happening this summer at the United Nations Headquarters in New York. The NGO/DPI executive committee elections will follow.